It was nice to have at least one day off this holiday Easter Weekend with my family. As Facebook is flooded with beautiful Easter photos it’s time for us to reflect on life whether it be for religious reasons of for your own reasons. My wife said to me her favourite holidays during the year are the days when everything is closed in Canada. She said she feels some sort of peace with the day as there is little to no stresses of daily living. It just seems to vacate for the day. I know not every business or operation is closed as we still need to run hospitals, fire, police, ambulance and so on but the majority of stores were closed Good Friday 2015. Although, if you are a fan of Tim Horton’s rest assured they were open yesterday and the long line-ups proved just how much money they are making when all the other coffee shops are closed. Many restaurants are open for the Easter Weekend along with some Shoppers Drug Mart stores. I guess it really depends on where you live so check your local listings. Come Easter Sunday again most shops are closed to celebrate Easter but I’ll be in work with the rest of the best who have to go in. I was going to make my Lemon Loaf to bring for Easter Dinner but that didn’t happen. Work always gets in the way but I can’t complain since I have a job. We didn’t get a chance to go home to be with the relatives for Easter weekend so we decided to find and create some of our own Easter activities for little to no cost to us. Our son is just about 7 months old now so he can’t do the Easter egg hunt just yet but we wanted to make sure his first Easter weekend was a memory he can look back on if only in photos and video. So what free or almost free fun did we get ourselves into so far this Easter Weekend? Dressing up for Easter and any other holidays is so much fun…again we hit the dollar store for some Easter Bunny Ears which cost us $1.00 but a ball of laughs from everyone who saw him. We were given a bucket full of those plastic Easter eggs so we hid them around the house and had a mini Easter Egg Hunt. Although he didn’t really understand what was going on we managed to get lots of laughs out of the boy. There was no chocolate Easter Egg hunt I’m afraid but maybe next year we will do something small. Going to the park is totally free so that’s what we did. We dressed him up warm and put on his Easter Bunny ears and away we went. We had a blast seeing the Canadian Geese, ducks, squirrels, crows and seagulls for the first time. The looks were priceless. There were lots of kids in the park as they were holding Easter in the Park where lots of crafts and entertainment was taking place. It was nice to be involved with the kids and other families because for years we would never even dream of going to an event like this. We blew lots of bubbles with mum while dad baked a batch of Shortbread Easter cookies to pass along to friends for Easter Sunday. We also read lots of Easter books that we picked up for free from Facebook over the past year. He loves when we read to him. After all of this fun I managed to cook a nice Fish dinner for Good Friday meal of Basa Fish Fillets on top of a salad of mixed greens. A friend of ours gave us a bottle of sweet white wine which we finally opened which was nice since my wife and I rarely have time together to enjoy romantic moments. It was the perfect end to the day, our Easter Weekend wrapped into one day! There are so many other things you can do for free or near free this Easter weekend so don’t be afraid to ask on Social media or check out the newspaper to see what’s happening in your city. If you aren’t sure there’s no harm in creating your own fun for the family like we did. Next year when our boy is bigger it will be game on for chocolate and an Easter hunt plus all the goodies that he wasn’t able to participate in this year since he’s so small. We may even colour Easter eggs too! You can still have fun and bring your kids to events when they are young as I believe somehow they will remember the love and laughter surrounding them. What free or near free Easter Weekend activities did you do with the kids or without? There’s never a dull moment around CBB. If you were trying to use the site on Wed night you may have noticed it was shut down. My host shut me down again for the third time so I’m looking for a new host that can handle the size of this blog without giving me the run around all the time. Time to move on. Grayson is doing an excellent job managing the sites maintenance for all of us although sometimes I know he secretly wants to call me all sorts (ha) because I’m a pain in the back side. You know when I wrote about saving money by DIY well this is one area I need not touch or I will cause major destruction. When you are busy and the blog goes down it’s hard to figure it all out and that’s why I’ve hired him for CBB. Moving forward I’m hoping to invest money where it’s not going to cause me a pain in the you know what. On a good note for the blog my dear blogger friend Karen from Lil Suburban Homestead gave a shout out to Canadian Budget Binder in her latest Podcast “Living on One Income“. It’s one hour full of money saving tips and fun! Check it out. At home this week my wife won a Facebook auction for $5 and got a load of excellent condition toys for our son which would have cost well over $150 to buy new including Baby Lego. That’s our deal of the week! Other than that it’s been work as usual but I’m enjoying my two days off a week these days. We are currently planning a trip for 2015 but I’ll update you more once I know more. Just in case you’ve missed any of my blog posts this week I will link to them all below. If you have a question that you would like to ask Mr.CBB fill out the Contact Mr.CBB form on the Home Page and send in your questions. If you want to share a story please ensure that there is minimum 500-1000 words and details… we love details! Mr.CBB (that’s me) will look in his mailbag weekly and pick a question to answer on the blog. Top 5 blog posts that are popular for the month. The Scanning Code of Practice in Canada-Did you know? Saving money while grocery shopping is essential in the CBB family and that’s why we share our grocery shops every week in The Grocery Game Challenge 2015. What I love the most is when my fans share their amazing shops with me whether it be groceries or other deals they find at a garage sale, online or freebies!!! If you have a brag that you want me to share email me at canadianbudgetbinder (@) [yahoo] [.ca] or fill out my contact form by Friday each week to have your brag considered for the Saturday post. This week CBB fan Colleen scores more FREE STUFF….. Here are a couple of photos of our free “new to us” items that we picked up recently. Some friends we have owned the lumberyard/gas bar here in town. The items we got free were being stored there but the business was sold and these items were destined for the landfill. Who throws out a leather couch just because it needs a spring fixed and a stain from hair products on it? A blanket folded on the back of the sofa covers it up. 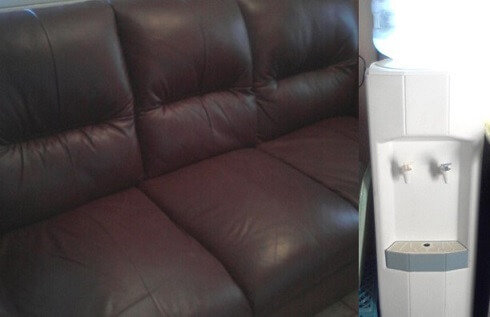 The sofa was not that old and when they thought the springs had gone while under warranty, they received a credit to new ones and were able to keep this one. The water cooler was just sitting in the middle of what they called the “saw shack” (a room near the back of the building for the big saws). Living in a small rural town does have it’s FREE advantages. Note: If you are a personal finance blogger (anywhere around the world) and would like your blog to be MAD featured simply drop me an email and I’ll explain the process to you. This is my way of giving back to the personal finance community through networking and sharing knowledge with my fans. Today I’d like to welcome Bradley from BTJ Personal Finance. My name is Bradley over at BTJ Personal Finance and I’m on a journey to replace the income I receive from my job with passive income. I know what your thinking, another passive income blog? Really? This is different, I’m not an expert on the subject, I have no knowledge about it other than what I read. I’m starting from ground zero and documenting the entire journey so that others can learn along with me what works and what doesn’t work when it comes to making real money on the side. The majority of the passive income missions that I go on are meant to be extremely cost-effective, but are also very work intensive initially. After all, no one really thinks its easy do they? I guide you through the process and let you see my passive income numbers as often as I can so that you know exactly how much effort it takes to achieve the same goal. I’d love to have you stop by and check things out, hopefully you’ll enjoy what you read and join me on my journey. Food and grocery shopping is a BIG part of CBB because food is a large part of the budget which people struggle the most with. If you are someone who would rather buy convenience meals or products consider cooking homemade meals or baking from scratch. Not only will you save money but you will be proud of what you accomplished and you’ll see that from the smiles on those you feed. If you don’t already know I have a second Facebook page called The Free Recipe Depot where I share recipes from other Food Bloggers from around the world. I created this second Facebook page because I love food so much and I wanted to showcase only food 24/7 and this is where I do it. 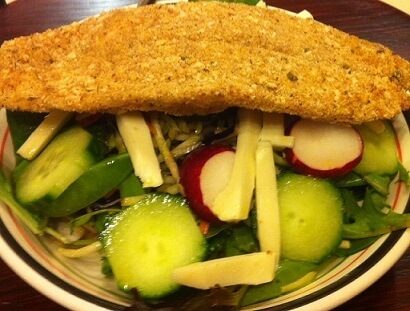 I also share recipes on CBB once a week on Sundays either made by me or my in-house home blog cook Nicola Don! 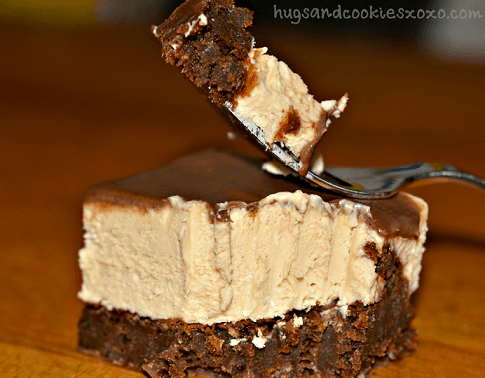 Today you MUST check out this recipe for Chocolate Peanut Butter Cheesecake Brownies from Hugs and Cookies xoxo blog. Now I need a BIG glass of Milk! Every week I will pick a blog post of the week from around the web that I found interesting and want to share with you and an Editor’s top blog post pick. Editor’s blog post pick of the week goes to Raising our Kids. This week I’m doing something different. Instead of picking a finance post of the week I decided to change it up a bit just for this post. Since this is Easter Weekend I wanted to share a website that has lots of free printables including Free Easter Colouring Sheets for the kids. If you want to add a free colouring activity to your day for the kids simply pick the Easter sheet you want, download it and print. It’s that simple. While you are there have a look around to see what other free stuff you can find on this amazing Parenting Site. Every week I get thousands of people visit Canadian Budget Binder because they did a search online and found my blog. Keep in mind any spelling errors below are because I share with you the exact way they typed their search engine query to land on my blog. How to be debt free and rich– Win the lottery! Food Budget Game– Awe, how nice to read this. Jobs for uneducated teen mom in Canada– Sad but this is a reality although it’s nice to see she is looking for a job. Kudos to you! Should I marry someone for financial security?– Um, no and no. Not unless you want to be miserable for your entire life. Thanks for reading The Saturday Weekend Review and Welcome to 2015 on Canadian Budget Binder!! The Saturday Weekend Review #112: Are basic math skills a must-have when dating? Happy Easter guys! After we cleaned up our room, I’m planning to cook a special dinner for my family and I hope they will like it. We went to my SIL’s place yesterday for a family gathering, tomorrow I will cook up our turkey I got back in Dec and parked in the freezer for a while. When our kids were younger we took them to the Easter Egg hunt in town here and they enjoyed it. When the grandson was younger my daughter got a few plastic eggs, put some little things in them and hid them in the apartment for the grandson to find. He had so much fun, he would find the eggs, and take them back to her so she could hide them again. They did this for half the day!! We thought it was funny but he was having so much fun ‘finding’ the eggs even if he watched her hide them!! Wow Nicola!!! Sounds like a great time for the kids!! Both my boys loved that kind of thing when they were younger, they are still interesting in things that fly!! Except bugs. The older boy has a couple of RC planes and helis. The local paper here always has colouring contests for the kids every holiday and I save those pages for the grandson to colour.. When he was still in daycare I would make enough copies for him to take to daycare for all the kids there. It was a home based place and she had 3-4 kids plus him depending on school holidays. He thought it was great and so did his care provider. Colleen sure got lucky with her goodies!!! So nice to have such nice friends!! Hope everyone has a very Happy Easter!!!! That sounds like fun. You are the Queen of finding great deals and if there is a coupon, you will find it. Good for you, the savings are worth it. I like the Jellies idea! Happy Easter to the Don family.